As I wrote in my blog yesterday, on Thursday the 15th I'll be leading a discussion session about open governance in the Open Innovation track at the 'Summit of new thinking' in Berlin. #SON12: Jos Poortvliet - Open Governance done right: creating rules without ruling from newthinking on Vimeo. I'm actually looking forward to that: the 'open innovation' thing was what once got me professionally interested in Free Software communities (while studying Organizational Psychology) and I still consider it an exciting topic. I did my thesis on open innovation but 10 years ago there was barely any research done in the area of open source governance and when I asked questions to my professors, blank stares where the result. These days, things are different (see for example this interview): the Academic world has seen what open source organizational methods can do and there is quite a bit to read about it. The idea behind Open Innovation is to involve the entire organization with innovation and improving things. Both big and small - we're not just talking about creating 'The Next Big Thing' but also improving current products, structures, processes and more. Think about it as bottom-up innovation. That only works if you have the right governance: the right structure and rules. Innovation is the first thing you stifle if you make mistakes in how you set up an organization. And you can't just create a 'department of innovation', stuff a bunch of folks in a room and tell them to innovate. It just doesn't work that way. Innovation comes from interaction: people talking to people. Sales together with Engineering, that kind of stuff. Creating an organization which is conductive to innovation is not easy. Open Source communities of course excel at this: their organically grown structures and informal rules let people 'do what they want' and freedom is the foundation of innovative cultures. But these ways of working have their limitations - you can't be informal forever, not if you grow big. At some point, some guidance has to be there to prevent things from clogging up the wheels of innovation. Things like personal conflicts, fights about creative directions, strategic disagreements. And this is, again, where governance comes in. My session is sub-titled "creating rules without ruling", as in my opinion, it is more about writing down existing but implicit rules than creating new ones. Interesting in this regard is the Open Governance the Qt project is working on: building such structures 'from scratch' is not easy. You have to find out where you agree, yes, but while writing things down, implicit things become explicit and that goes for (potential) conflicts then too. But being able to do this in a fresh community, before ideas get entrenched! Having a chance to set direction in a 'soft' way. Terribly exciting! Meet me, talk to me! If you want to share thoughts with me on this topic, meet me at QtDevDays or at the Summit of New Thinking - or other events in the future (how about FOSDEM?). Rule No.1 for innovation: Have fun! Since the Akademy conference in Estonia beginning of August I've been rather quiet as I have been struggling with health issues. After loosing some blood and undergoing a few *scopy's the people with stethoscopes don't seem too worried so neither am I but it has been unpleasant at times. Not too many tests left - an MRI and another 'scopy' in December, I hope they can give me a diagnosis by then. It has been frustrating to have had to cancel trips to the openSUSE Summit, COSCUP, Brazil and more. And at the openSUSE Conference (my first trip in 3 months) I had to skip the evening fun - instead opting for quiet food-in-the-hotel and early bed. Believe me: not nice. Luckily, I'm getting back on my feet and at a recent visit to Nürnberg I even went out a night with my new team mates. 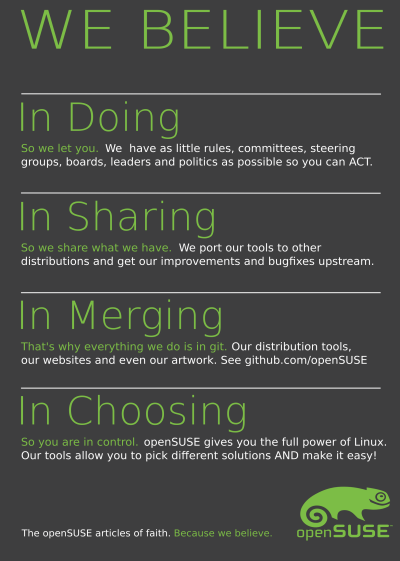 Yup, a new team - if you're following the openSUSE mailing lists, you probably have heard that already. In my two years of 'community manager' of openSUSE, I've worked with people around the company and community - but I was not really part of a formal team. Independence is nice but it also can make you take on a few things too many - I know I did. So, when it was decided to try and re-arrange things with regards to the openSUSE Boosters team, I decided it was a good idea to join the team and help it find directions. Together we can do more, and all that. It means the scope of the former boosters team (now just 'openSUSE team') has widened: I will of course continue to care about the things I used to care about. Things like the atmosphere in the community, governance, strategy - and of course marketing, the ambassador program and presenting a friendly face to the wider Free Software world. But I'll be doing that together with the rest of the team now, not alone! Things are quite different now, so let's see how it'll go. So, the openSUSE conference was my first event since a while. It was quite awesome, with a lot of faces I hadn't seen in a while and a lot of excitement. We organized a bunch of interviews with people, which will be released over the coming months. 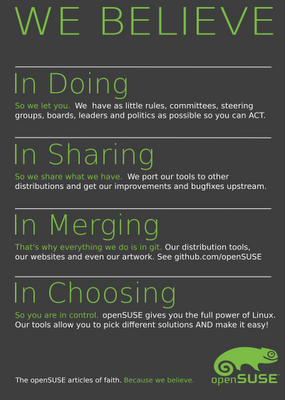 On the openSUSE days, a few important things were discussed, results of which have been posted to mailing lists. I'm working on a summary of that but it'll take a bit longer. One thing I already managed to change: Richard gave some feedback on the 'we believe' poster and we decided it needed a fourth item. Which I added, see the image on the right. You can get the source for the poster in our github repo. There'll be more events, of course. On short notice, I'll be at the QtDevDays in Berlin - it's practically next door and a great way to meet people. I've heard we can expect 500+ people there from all over the (huge) Qt ecosystem. It'll be interesting to talk to people outside of the usual Linux crowd: Qt has managed to grow well beyond the Linux Desktop into an industry standard for a wide variety of use cases. On Thursday the 15th I'll be leading a discussion session about open governance in the Open Innovation track at the 'Summit of new thinking', also in Berlin. I'll write a tad more about that in a blog tomorrow.